Writing a review of The Three Stooges is an interesting challenge. Narrative coherence is irrelevant when the story only exists to provide an excuse for eye-gouging and set-wrecking. Dialogue doesn’t need to be more eloquent than an angry “Why you!” I’m not even certain that normal standards of acting apply. 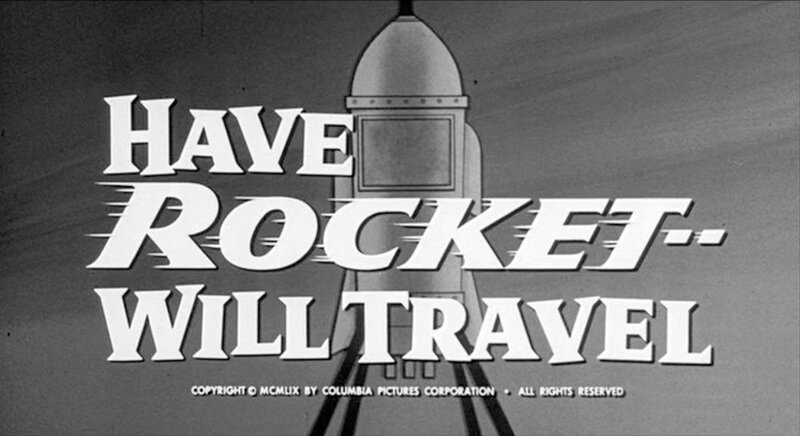 But, since there’s a giant spider in their film “Have Rocket — Will Travel”, I’m prepared to work through all that. Let’s start with the title. If it doesn’t sound familiar, it should. Stooge titles tend to be plays on expressions or titles of other works. In this case, it’s a reference to the popular western show “Have Gun — Will Travel” that began airing in 1957 — two years before the release of this film. There’s no other connection to the show, but the reference is reinforced with a title song that is sung by the Stooges over the opening credits. I’ll watch your movie. Just please stop singing. Speaking of credits, the Stooge line-up for this outing is Moe Howard, Larry Fine, and Joe DeRita (Curly-Joe). Curly-Joe gets some guff for being the second substitute Curly, who himself replaced Shemp. (Being the third Stooge was seemingly as fatal as drumming for Spinal Tap1.) Curly-Joe does a decent enough reproduction of Curly’s routines, and he provides some genuinely entertaining moments, so I’m not going to dump on the guy. I think he just suffered from being cast at a time when the Stooges were just re-enacting stale clones of their previous routines. Speaking of clones, I should give a quick rundown of how the set pieces stitch together. We start with a rocket test by the National Space Foundation (NSF). This is their 4th launch, and there’s a monkey on board — because I guess in the 1950s it was mandatory to put a monkey in space movies. The test fails, and the rocket crashes. The Stooges, who are the maintenance men on the base, are put in charge of guarding the fallen rocket. This leads to the Stooges chasing the monkey all over the rocket until it accidentally rights itself. Here’s where things get unnecessarily complicated. Dr. Ingrid Naarveg, lead (and apparently only) scientist at the NSF, is nice to the Stooges. They see her as a daughter and want to help her keep the project alive. In order to do that she needs to find a better fuel. Stooges to the rescue! In the course of a night they brew up a more powerful fuel (the secret is sugar!) and load it into the rocket. The head of the NSF, angered by the Stooge’s nocturnal activities (and the inevitable ancillary destruction), manages to chase them into the rocket and launch it into space. Our promised space travel is under way at last! Once on Venus, the Stooges encounter a talking unicorn, a giant spider, and a tyrannical robot (that makes clones of them because it likes their form). They also sing more of the title song. On their return, the Stooges are hailed as heroes. They leave the clones in their place and run off with the talking unicorn to sing more of that infernal song. You don’t have to be a Stooge fan to find their rise to fame predictable. It’s a given in American comedy that experts are fools and fools are experts. Opposites attract, experts are unmasked, the simple are rewarded, and there’s probably a wedding. In this case, the wedding is between Dr. Naarveg and the base psychiatrist. Barely in the movie, their roles consisted primarily of 1) Dr. Naarveg providing unnecessary motivation to the Stooges and 2) the psychiatrist repeatedly telling her that she’ll only find happiness by marrying him and abandoning her career. He finally convinces her with a sudden agarring2. It was, after all, 1959, and while a comedy could make a woman the lead scientist in a space program it would also make certain to put her back in her place by the end. Additionally, while the pompous head of the NSF gets a humiliating take-down, remember that three bumbling clods managed in one night to produce the breakthrough in fuel that eluded Dr. Naarveg. That’s got to hurt. Some of the Stooge routines were painful, too. Interestingly, it wasn’t due to the performances. A classic routine is a classic routine, and old and fat as they are the Stooges are skilled physical comedians. I place the blame on the director, David Lowell Rich. Rich was a workman director, the bulk of whose career was spent in TV. B-Movie fans may have seen the TV movie “Satan’s School for Girls” (an Aaron Spelling production), but his most remembered work is possibly “The Concorde — Airport ’79”, the final nail in the coffin for the Airport franchise. It’s clear that Rich and cinematographer Ray Cory had no idea how to film the Stooges. These are guys who mastered their craft on the stage, and when they went to film they largely kept that full view ethos. They fill the screen with broad movements and large messes. Here, the camera often slows things down, breaking the frenzy of action into careful and discrete pieces. It just doesn’t work well, and (as in “Yellowbeard” and “The Villain”) the humor doesn’t survive filming. That isn’t to say that nothing works. A few scenes work very well, mostly because the close shots are mixed well with larger fields of chaos. Two of these are standard Stooge set pieces: the bedroom and the ballroom. The first shows the unusual morning routine of the Stooges, and everyone wrestles with appliances, clothing, and furniture. The second, of course, winds up in a pie fight. The society ball is where Curly-Joe shines. While the others are dancing enthusiastically with their new admirers, Curly-Joe just wants a piece of cake. His doomed effort sends the soirée flying face-first into its pie-filled fate, while he calmly accepts what is left for him. It’s a sequence that’s both entertaining and oddly reassuring. The other fun scene was the invention of the rocket fuel. Dr. Naarveg’s lab becomes a kitchen as the Stooges start mixing ingredients in a large vat. Much of the ensuing business is familiar, but it’s less pat than the other scenes. There’s something delightful about Larry intently brewing coffee over a bunsen burner, like the Walter White of caffeinated beverages. Of course, not even Larry tried to cook with the flame-throwing giant spider. That’s right: flame-throwing giant spider. Pretty much my worst nightmare. Almost immediately after disembarking on Venus, the Stooges are threatened by a giant tarantula (courtesy of forced perspective shots and editing). 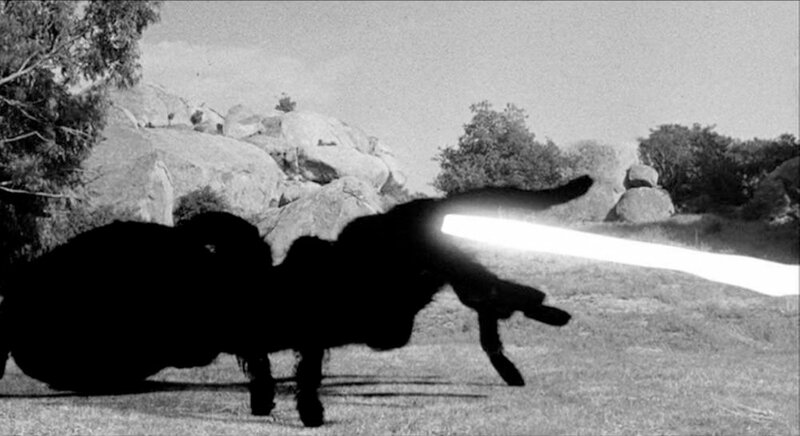 Then the film stops, and a light beam is drawn in, emanating from the tarantula. Flame pursues the Stooges as they run away. I’d like to tell you that there’s no real reason for there to be a flame-throwing giant spider on Venus. The crazy part is that there is a terribly convoluted reason. You see, despite all the nonsense about making fuel, the rocket is launched by igniting a lengthy fuse. It’s a strange plot point, requiring the base commander to accidentally (and angrily) light the fuse to send the Stooges on their voyage. Mysteriously, there is some fuse left for the return trip, and it’s up to the flame-throwing giant spider to reignite it. I fault screenwriter Raphael Hayes for the clumsy movement of the script, but I have to admire his fierce devotion to the fuse gag — a device that backed him so far into a narrative corner that only a flame-throwing giant spider could get him out of it. While rocketing to Venus, the Stooges turn on the communication console and get a TV Western. They change the channel and tune in the NSF lab, where Dr. Naarveg and her suitor are engaged in a dramatic scene in the style of a soap opera. I really liked the thought of the console having been installed so the monkey could watch his favorite shows. The robot is delightfully ill-constructed. It looks like the prop guy just stuck a bunch of crap on a box until he ran out. The Stooge snore gag works every time. There’s a keyhole at the base of the rocket. I find that charming, for some reason. 1. To be fair, Joe Besser didn’t die “in office”, as it were. 2. agar, v.t. to kiss the bejeesus out of a co-star. Named for John Agar, the grand master of the technique.